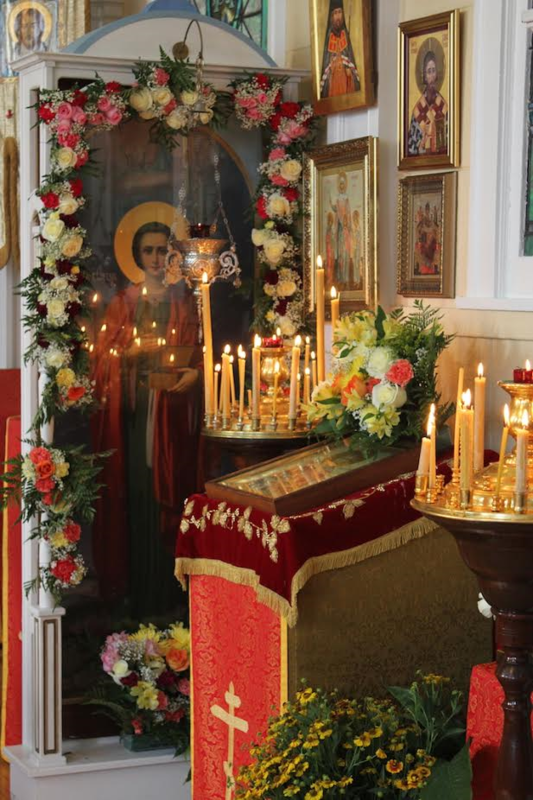 On August 9th 2016, the Day of Greatmartyr and Healer Panteleimon (+305), His Grace Archbishop Peter of Chicago and Mid-America held an archpastoral visit to the City of Minneapolis, Minnesota. 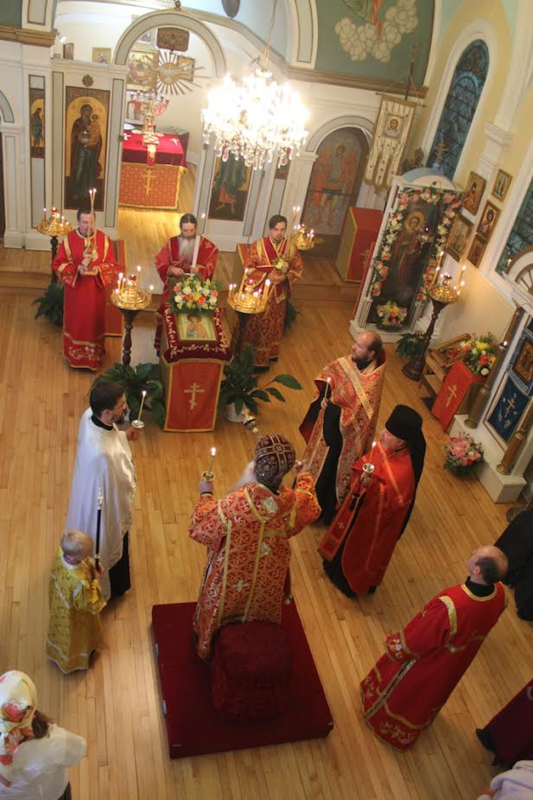 This year marks the 60th Anniversary of St. Panteleimon Russian Orthodox Church in Minneapolis and 1000-year Anniversary of the Russian monastic presence on the Holy Mount Athos. 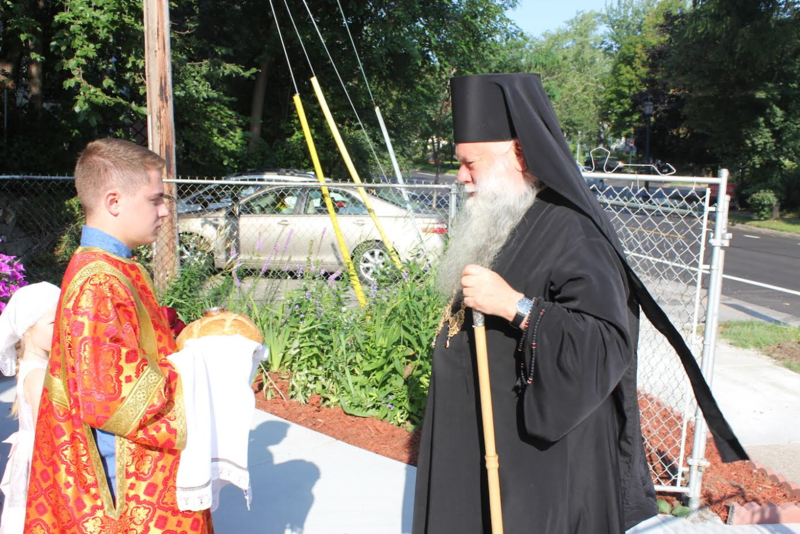 Also, this was the first visit of Archbishop Peter since his appointment to the Chicago See on July 2, 2016. 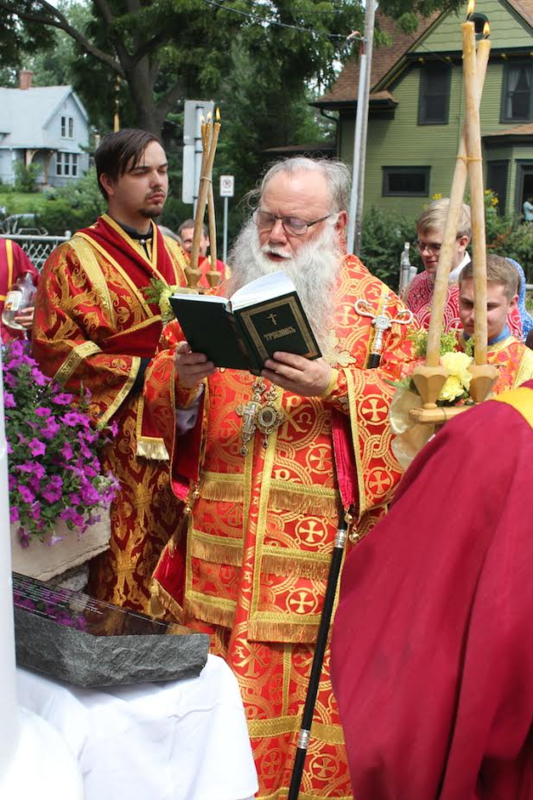 Archbishop Peter headed the Vigil and Divine Liturgy on the Parish Feast at St. Panteleimon Russian Orthodox Church in Minneapolis. 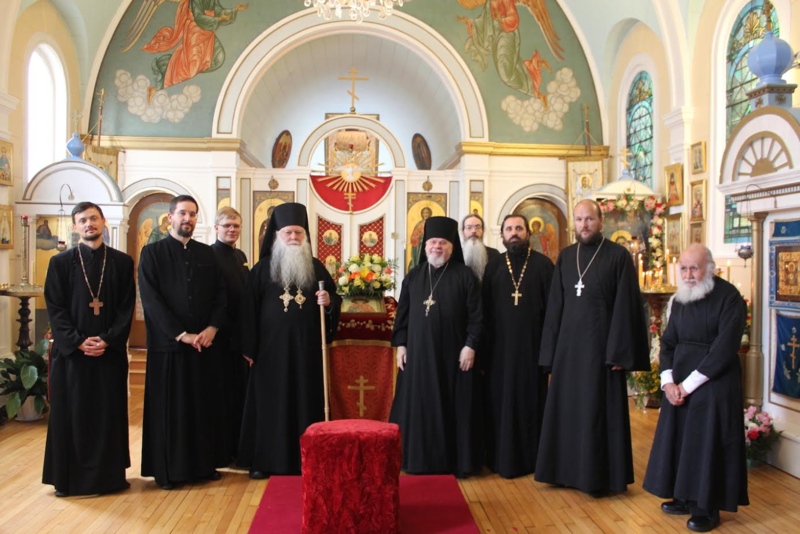 His Grace was co-served by clergy of the Chicago Diocese: Archimandrite John (Margamm), St. Seraphim Skete in Fridley, MN; Archpriest Basil Kuzmych, Rector of Holy Trinity Church in Milwaukee, WI, Dean of Second Deanery; Priest Mircea Vasiu (Romanian Church); Priest Antony Alekseyenko, Rector of the parish; Priest Radomir Plavsic (Serbian Church); Protodeacon John Cavin, St. Seraphim Skete in Fridley, MN. 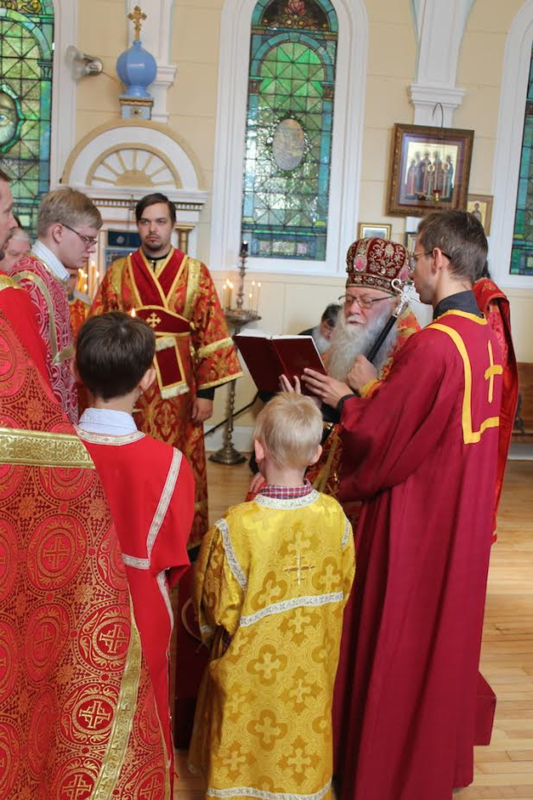 Protodeacon Basil Gilliland, parish deacon, and monk Seraphim (Surkov), St. Seraphim Skete in Fridley, MN prayed piously in church. Before the Vigil His Grace was greeted by the parish rector. 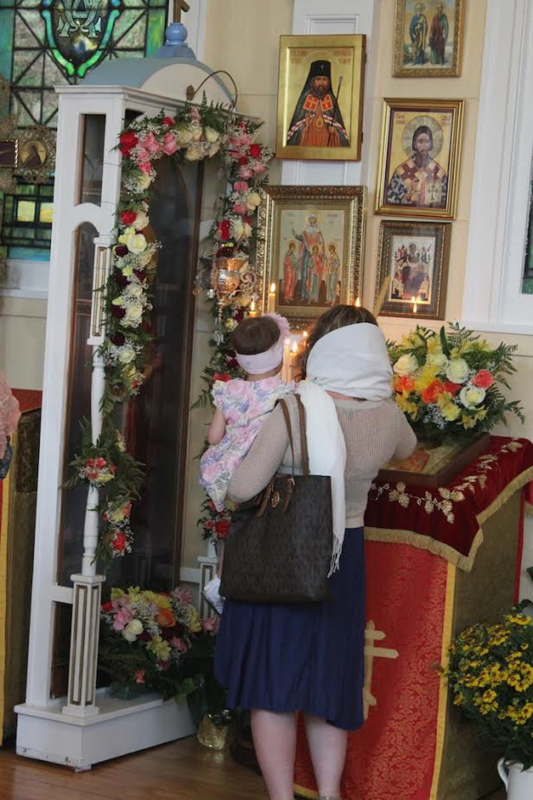 The Parish Icon of St. Panteleimon with relics was brought out to the center of the church at polieleus. 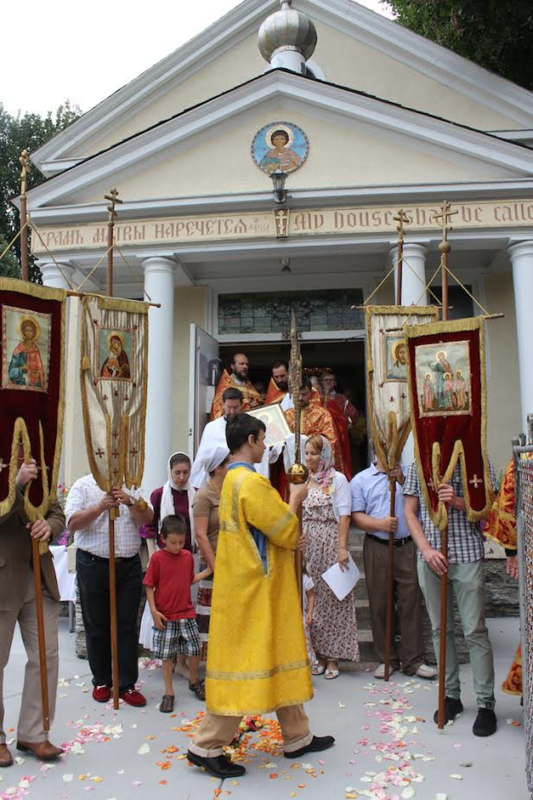 The Day of the Feast started with the Blessing of the Waters served by Parish Rector Rev. Fr. Antony Alekseyenko. 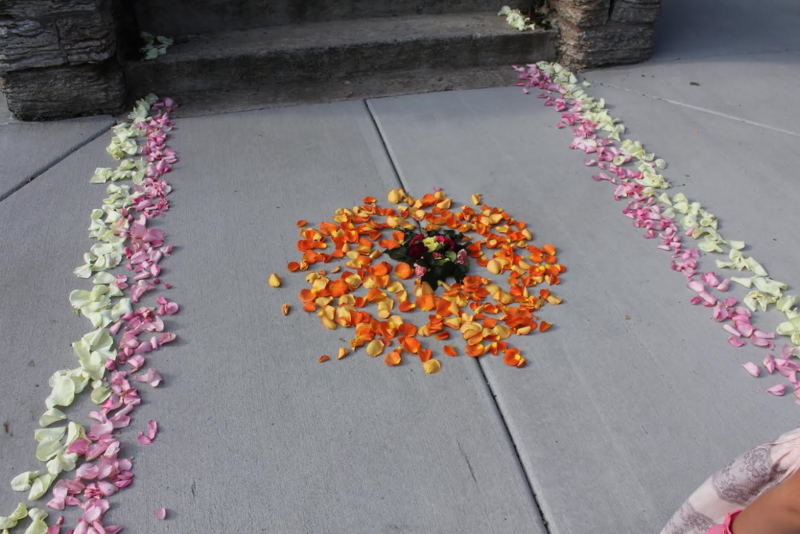 In spite of it being a weekday, Liturgy was attended by people not only from all over Minnesota, but also from the neighboring stated of North Dakota, Wisconsin and Iowa. 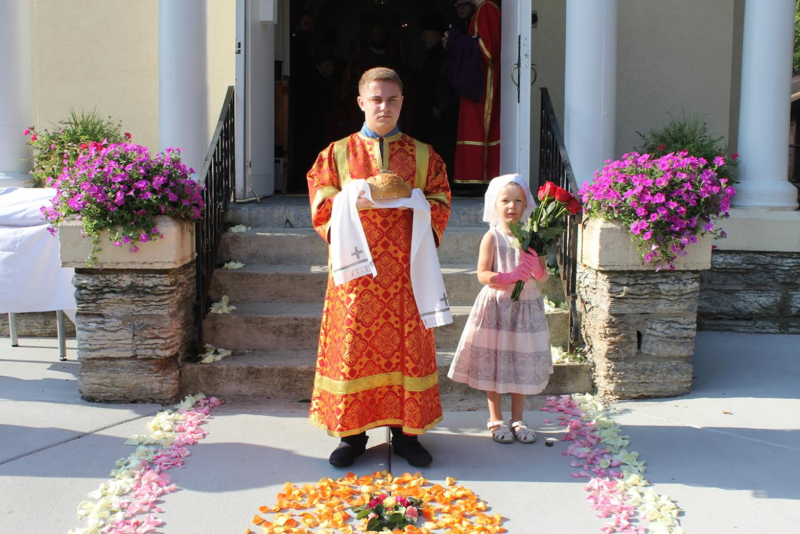 Before Divine Liturgy His Grace was greeted by parishioners with bread-and-salt and flowers. 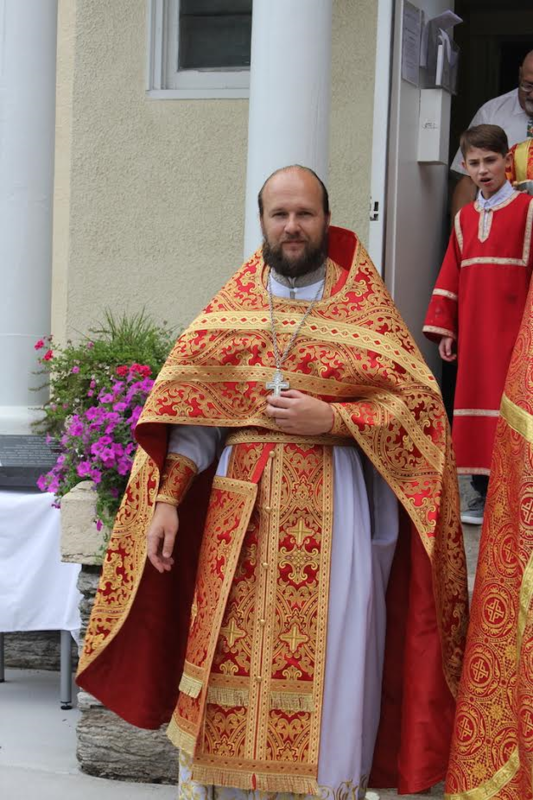 After the Third Hour Archbishop Peter tonsured a reader Alexander Poppenhagen for St. Seraphim Skete in Fridley, MN. 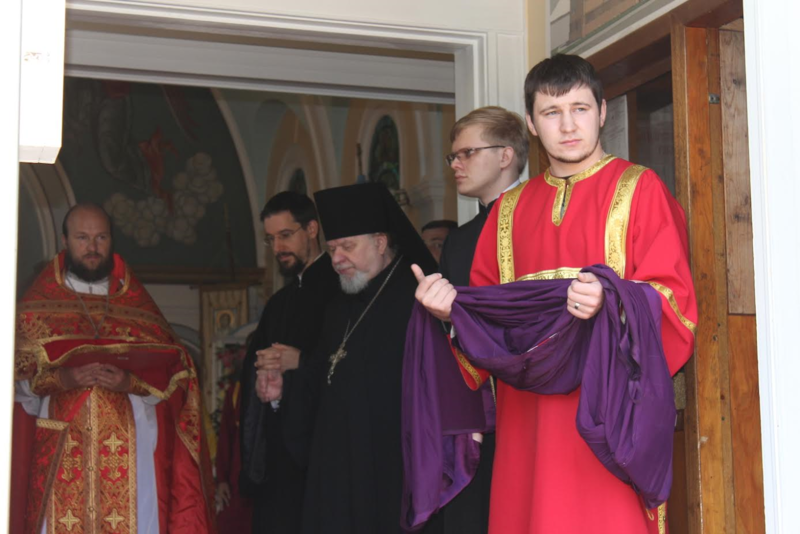 After the Augmental Lithany His Grace read the prayer for peace in Ukraine. 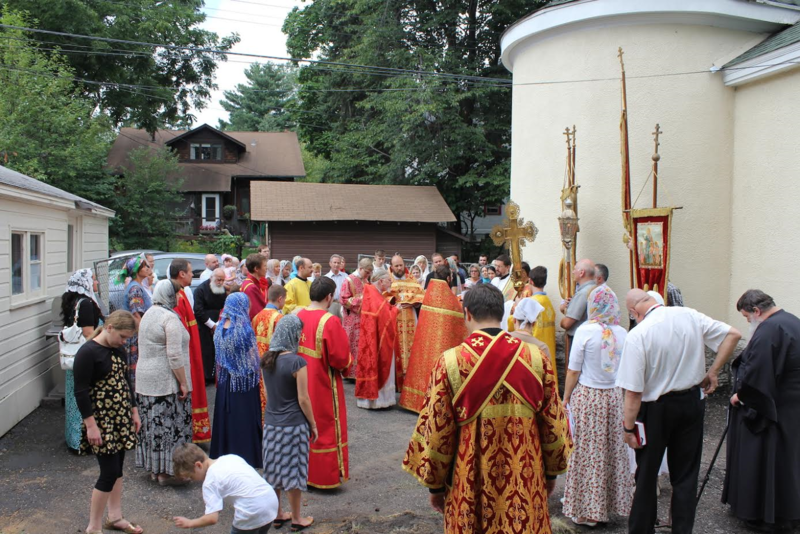 The choir sang under the leadership of Galina Adjunts – parish choir-director. Many came up for Holy Communion. 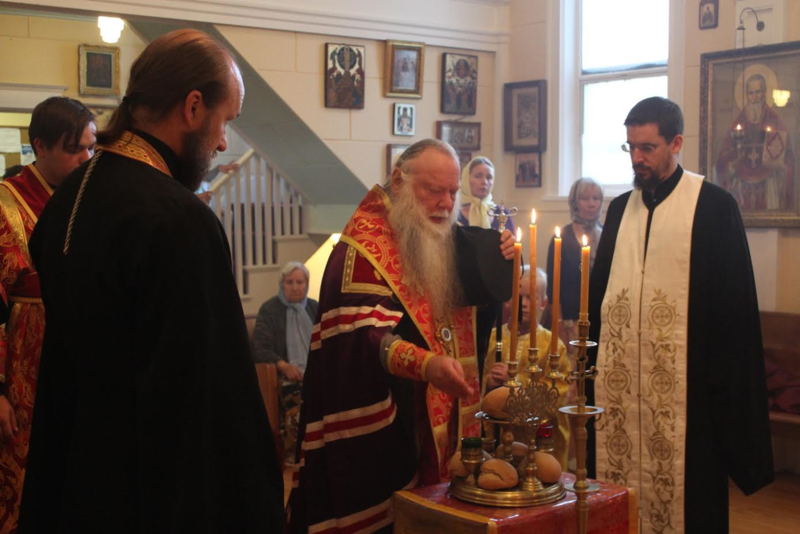 In the sermon at the end of Liturgy, Archbishop Peter noted the importance of monasticism in the Church life, as well as underlined the spiritual and intellectual role of monasticism in development of Russian Orthodox Church and Russian state. 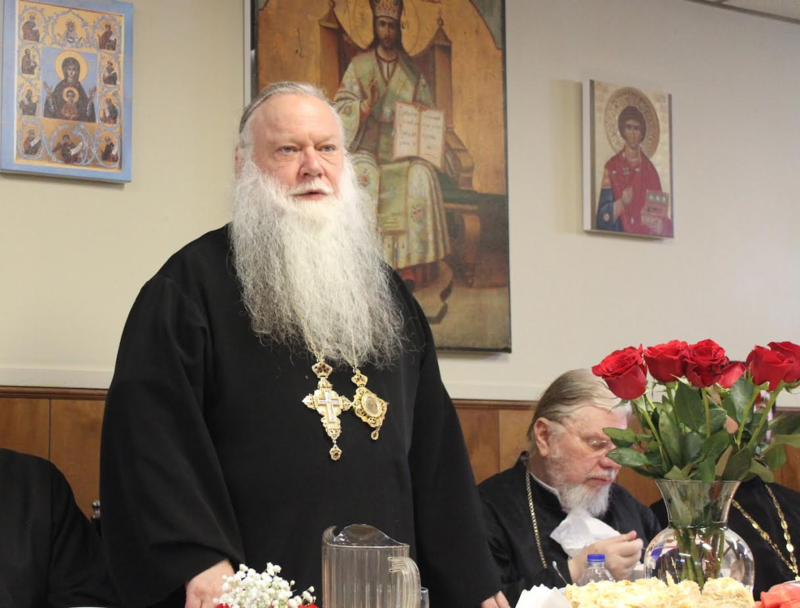 His Grace remembered Metropolitan Anthony (Khrapovitsky) (+1936) in his sermon, his connection to Holy Mountain, and the 80th anniversary of his blessed repose on August 10th this year. 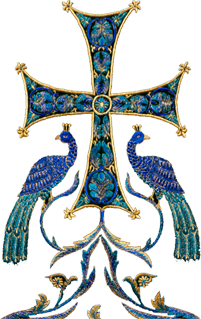 The Supplication service and Cross Procession was served at the end of Liturgy. 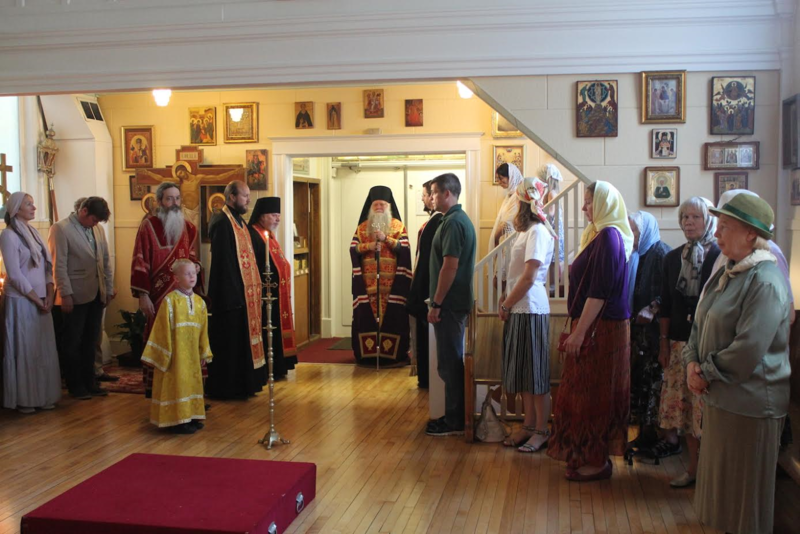 On the last stop before the church entrance Archbishop Peter blessed the stone marking, “60th Anniversary of St. Panteleimon Russian Orthodox Church in Minneapolis, Minnesota and 1000-Years of the Russian Presence on the Holy Mount Athos,” and read the prayer to Greatmartyr and Healer Panteleimon in front of the Parish Icon with relics. 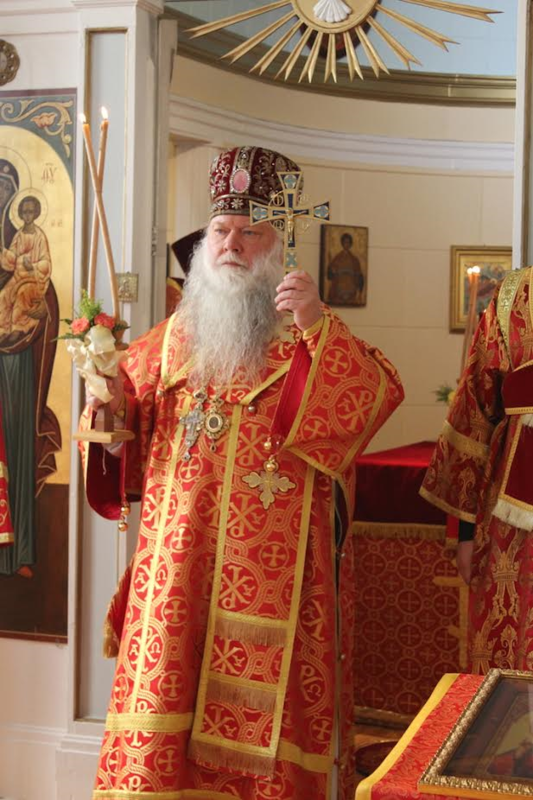 Many years was intoned to His Holiness Patriarch Kirill, His Eminence Metropolitan Hilarion, Hierarch of Russian Orthodox Church Outside of Russia, all Russian monastics, parishioners, Rector, brotherhood and sisterhood of St. Panteleimon Church in Minneapolis. Fr. 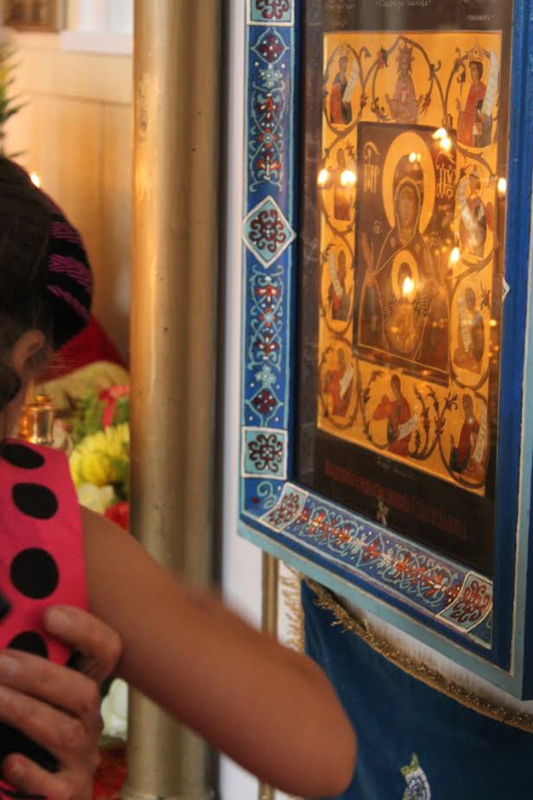 Antony greeted His Grace from the parish and gifted an icon of St. Panteleimon made by parishioners, as well as asked to convey another embroidered icon of the Greatmartyr to Metropolitan Hilarion honoring this day. 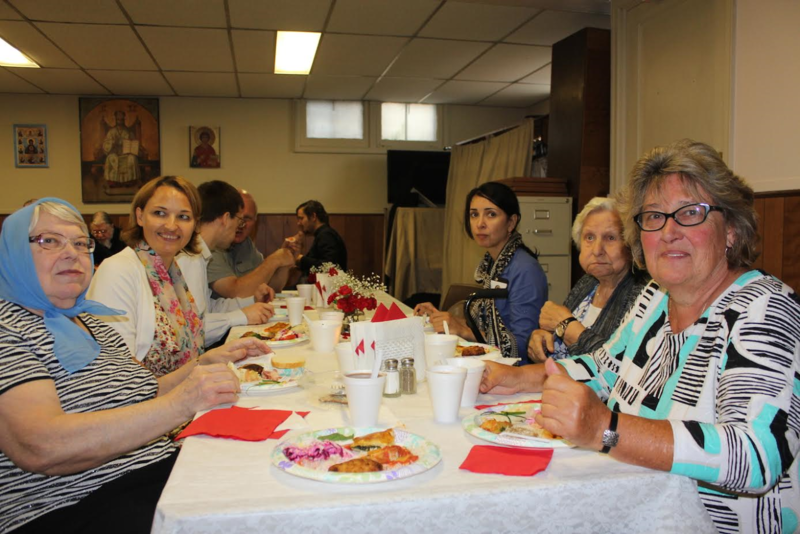 After the Cross, the Parish Sisterhood invited the clergy and laity to the church hall for a festive meal, arranged by parishioners. Archbishop Peter noted the importance of brotherly fellowship after the service, which is the continuation of the Eucharist – agape. 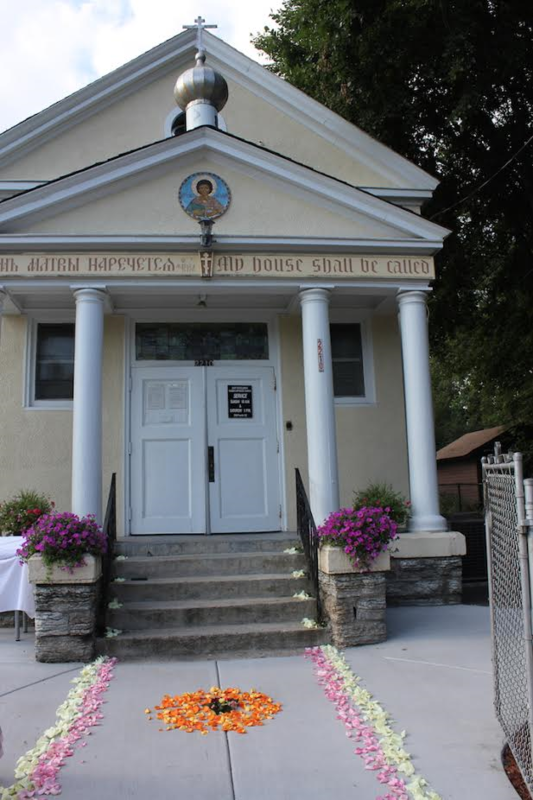 His Grace invited everyone to Protection Cathedral in Des Plaines (Chicago) on August 30 (Day of remembrance of St. Alypy of Kiev-Caves (+1088)) for honoring His Grace Archbishop Alypy, which will be headed by the Hierarch of ROCOR. 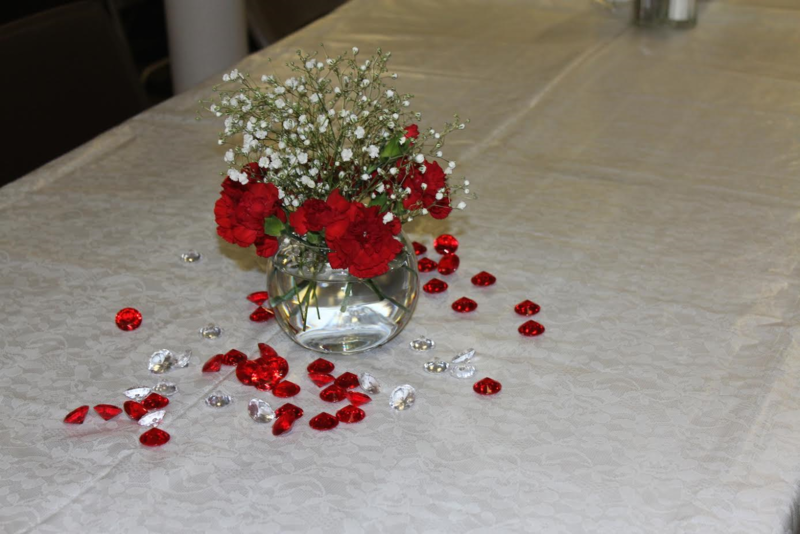 After the festive meal Archbishop Peter thanked the Rector, parishioners, sisterhood and brotherhood for their labors and organization of the feast, and clergy for their prayers. 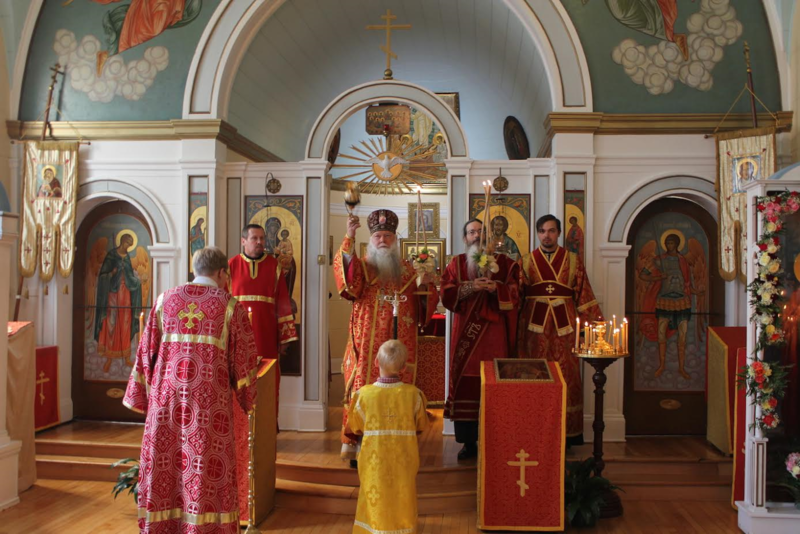 Also, see the photo report ( Hierarchical Visit on the 60th Anniversary of St. Panteleim...) from the celebration of the 60th Anniversary of St. Panteleimon Russian Orthodox Church in Minneapolis on the 5th Sunday of Great Lent, Venerable Mary of Egypt (April 17, 2016), which was prayerfully marked by numerous faithful and clergy, and headed by His Grace. 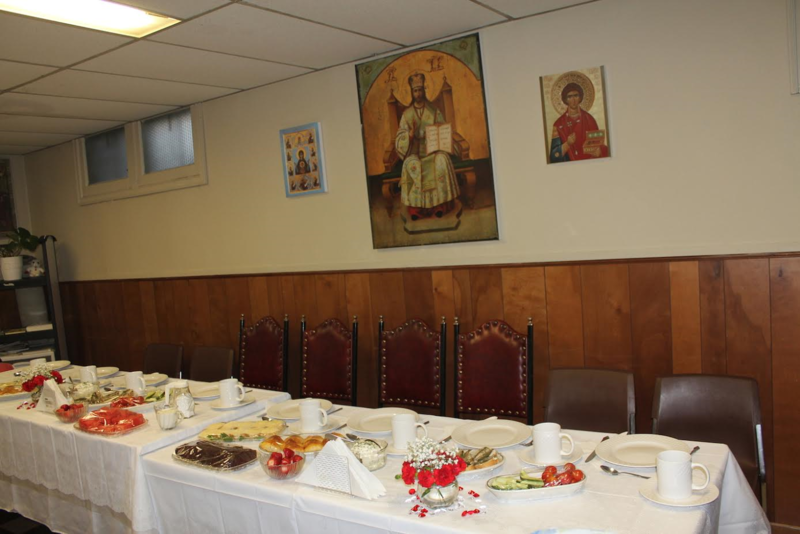 The banquette was organized in St. George Antiochian Orthodox Church in St. Paul, and the booklet was published honoring St. Panteleimon Church history and Russian monasticism.